There is nothing better than watching an unselfish team who are able to move the basketball around the court quickly and efficiently. Breaking down the defense with smart passing and getting each other free for open jump shots and layups. Wish your team could do this? The basketball passing drills on this page can help you achieve it. Unfortunately, most coaches only focus on 'technique' passing drills and forget about training their team's decision-making ability when it comes to sharing the basketball. Your players are not going to improve their in-game passing by making thousands of chest pass repetitions. While technique drills do have their place, they're far less important than decision-making basketball passing drills. We must allow players to learn how to read the defense and make correct passing decisions. The drills 'Monkey in the Middle' and 'Netball' below are two of my favorite drills for doing this. Also, passing drills are great to start practice with to warm up your team and get them communicating and working together. Players form 3 lines spread out evenly along the baseline. The two outside lines start with a basketball. 3 players progress up the court passing the basketball’s back and forth to the middle player and then finishing the drill with two layups. A fun passing drill that works on catching and passing without traveling, communication, timing, and also layups at the end of the drill. Players form 3 lines behind the baseline. The two players on the outside lines have a basketball each. The players start to move up the floor as one outside player passes to the player in the middle line. Upon catching the pass, the middle line immediately passes back out to the same player. The middle player will then turn and receive the pass from the other outside player and pass immediately back to them. The players on the outside lines can take 1 - 2 dribbles to avoid traveling. The drill continues up the floor until the players reach the opposite three-point line. When this happens, the two outside players dribble in and finish with a layup. The group then waits at the opposite end for the other groups to finish before going back the other way. Midrange or three-point shot - Instead of finishing with a layup, the players can finish with a midrange shot or a three-point shot. Up and back - Instead of waiting at the other end, the group can make two trips of the floor. One basketball - If you’re coaching very young players, you can run this drill with one basketball until they understand how it works. Passes must be passed in front of the player on the run using proper passing technique. Receiver must have his hands up showing 10 fingers and calling for the pass. Middle player must to catch the basketball and quickly pass on the run. Don’t allow travels! Layup technique is very important for this drill. Watch the footwork and make sure all players are doing it correctly. Players are divided into the groups of three. Each group has one ball. Two passers are lined up 12-15 feet apart. Third man in the group is “monkey in the middle”. He attempts to deflect or steal the basketball. Two outside players must pass to each other without the use of lob passes or dribbling. Just pivoting and using fakes to open up passing space and get the ball past the defender. Fun passing drill while also working on defense. This drill will teach players how to utilise fakes and pivots to create area to pass as well as protecting the basketball. ​​​​​Each group has one basketball. Passers lined up 12-15 feet apart, with third player (defender) in the middle. The drill begins with the defender playing tight on the player who starts with the basketball. The offensive player utilises pivots and fakes to make a pass to the other offensive player while the defensive player attempts to deflect or steal the pass. After each pass is made, the defender sprints to the receiver and plays tight defense again. When the defensive player gets a steal or deflection, players rotate their positions. positions after a certain period of time (depending of the age of the players, their strength, and endurance) instead of after every steal and deflection. 30-40 seconds for example. One dribble allowed – Allow the offensive players to make one dribble to open up the passing angle. This will make it tougher for the defensive player. Only bounce passes allowed – To make it harder for the offensive team, only allow them to make bounce passes to the other offensive player. It’s very important for the defender to have active hands and feet at all times. That’s the best way to get steals and make it tough for the offensive players. The offensive players must wait for the defender to recover before making the pass. The purpose of the drill is learning how to create passing gaps and angles. While there’s no set time limit, the offensive player with the basketball shouldn’t hold it for more than 5 seconds at a time without passing. The team splits up into 4 lines in the half-court corners. Players will then make a one or two-handed pass out in front of the player to their right who start running along the sideline or baseline. The passer then joins the end of the line they passed to. 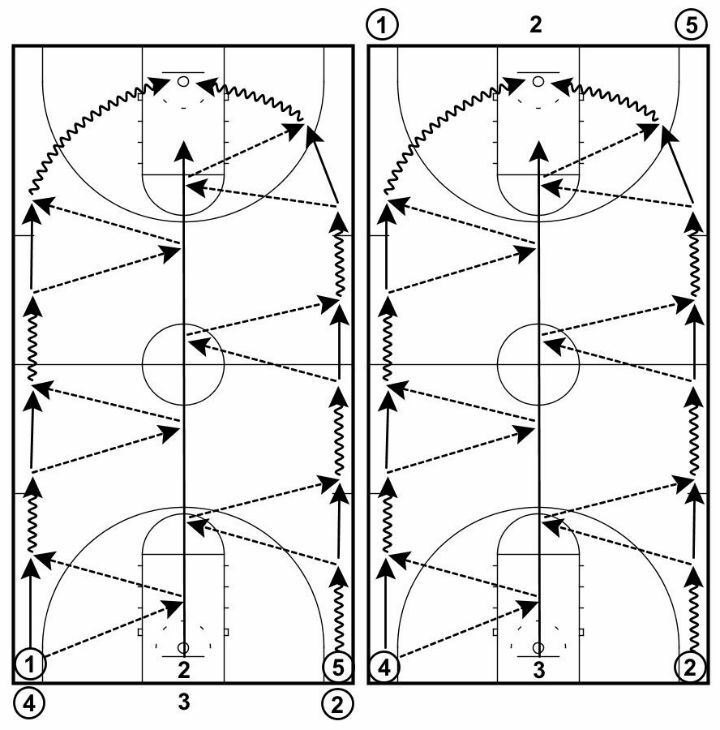 Passing drill intended to use mainly with younger players or as a warm up drill. This drill will improve passing to players on the move as well as being able to catch and pass without dribbling. ​The team is divided up into 4 lines. One line positioned in each corner of the half-court. The first player in one of the lines has a basketball. The drill begins with the player with the basketball passing out in front of the player in the line to the right. Before the pass is thrown, the receiver must start jogging in the direction of the next line they'll join so that they're catching on the move. The receiver will then catch the basketball as the next player starts jogging and will make the pass out in front of them. After each pass, the passer will join the end of the line they passed to. Drill continues in the same manner with players passing around the square in the same direction. After a certain period of time, the coach changes the direction of the passing. ​Include a Second Basketball – If the players are comfortable with one basketball, introduce a second starting in the opposite corner. Different Passing Types - This drill can be done with one-handed passes, two-handed passes, chest passes, or bounce passes. One Dribble - Players are allowed to take one dribble before making the pass to the next line. This can be beneficial if you’re doing one-handed passes. The receiver shouldn’t have to slow down or speed up to catch the pass. Passes must be accurate and out in front. The receiver must time their run so that they’re moving towards the other line and also have their target hands up calling for the basketball. It’s imperative that you don’t allow any traveling violations while players are running this drill. Don’t allow them to fall into that bad habit. 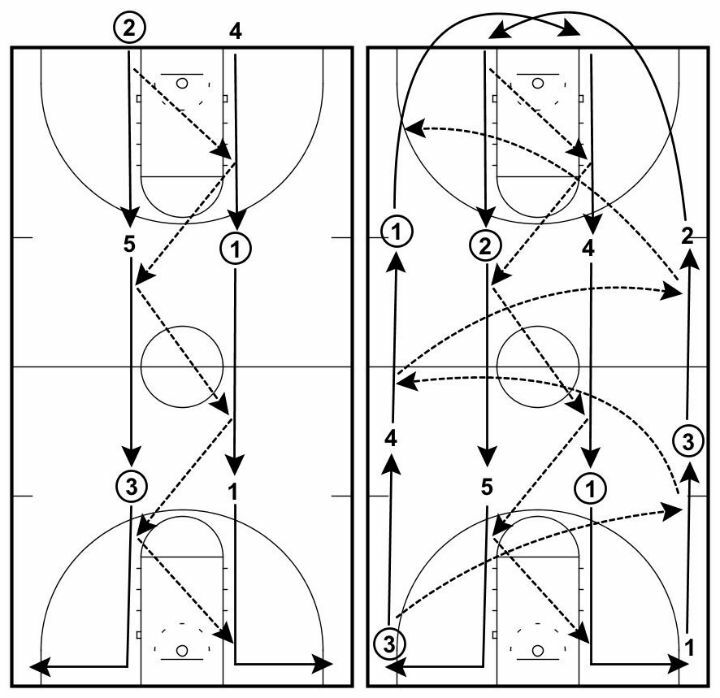 Run the drill at half-speed when first beginning until the players understand it. Then up the intensity. Starting on the baseline on the edges of the key, pairs of players will pass one basketball back-and-forth using a variety of passes as they jog down the court to the other baseline. 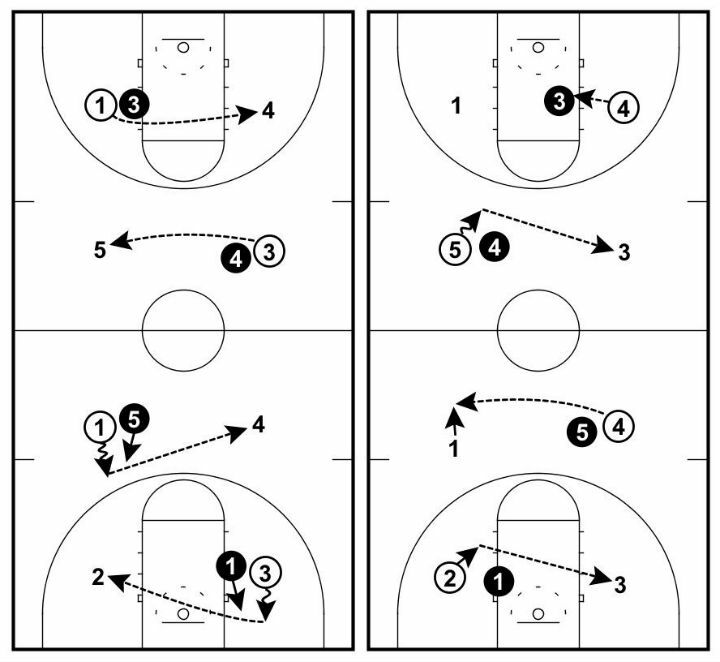 When they get there, they slide back closer to the sideline and return using a variety of passes over the players in the middle of the court. A great warm-up passing drill that provides a lot of passes in a short amount of time. 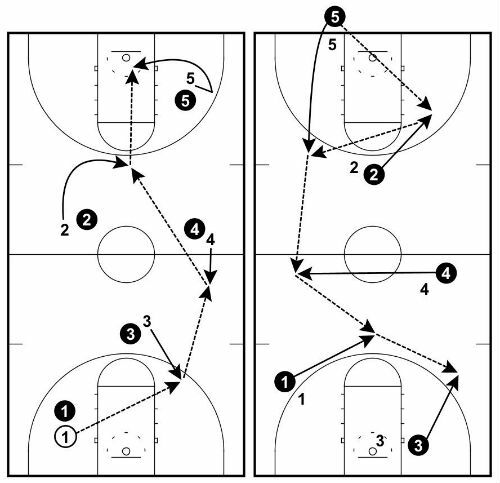 Including passes of different lengths and types for players to practice. ​All players find a partner. ​Each pair has one ball between them. ​Pairs divide in two lines behind the baseline on the edge of the key. The first pair starts by running slowly down the middle of the court passing chest passes to each other. As soon as the first pair is near the top of the three-point line, the next pair starts. When the first pair of players gets to the opposite baseline, they slide back closer to the sideline and go back passing over the top of the players in the middle. When the players get back to the start, they immediately join the middle lines again and continue through the drill continuously. Every couple of minutes, change the type of passes players perform for the middle lines and the outside lines. one-hand chest passes, and one-hand bounce passes. Passing for the Outside Lines - For the outside lines, here are a few passes I recommend: Chest passes, overhead passes, one-hand passes. Remember to take into account the age, strength, and skill level of your team when deciding which passes they should use during the drill. Monitor the pace of the drill; especially if it’s used as one of the warm up drills. Walking shouldn’t be allowed, but also avoid it becoming too intense. Accurate passing is the primary focus of the drill. Players on the outside lines shouldn’t be putting too much arc on their passes. They should be a height that’s safe enough to clear the middle lines, but direct enough to get to their partner quickly. Being able to pass one-handed with either hand is an important skill to develop. Expect mistakes when your players are first learning, but make sure you’re practicing them. Footwork is vitally important during this drill. Players must be able to catch the basketball and make the pass back to their partner within two steps. If you’re coaching young kids and they can’t, slow the drill down. After each trip down the court, players should switch sides so that they’re practicing throwing short and long passes on both sides of their body. A regular scrimmage with no dribbling of the basketball allowed at any time. Games can be played either 3 on 3, 4 on 4, or 5 on 5. A great drill to improve not only passing, but also moving without the ball, spacing, cutting, etc. 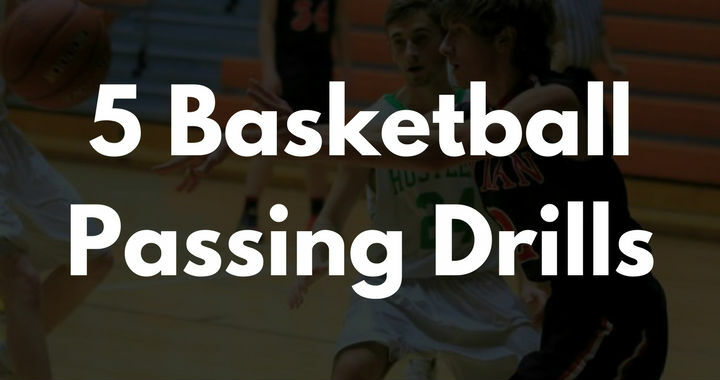 This drill will lead to less over-dribbling in games and fewer turnovers. Divide players in two teams depending on the number of players you have available at practice. Try to make teams similar height and skill level. The drill only needs one basketball. Teams play a regular full-court game — without dribbling! The drill can be run for any length of time. The game is played to either 5 or 11. Each 2-point score is worth 1 point. Each 3-pointer is worth 2 points. In case of a shooting foul, offensive player shoots one free throw for 1 point. Once bounce allowed - Players are allowed to take 1-dribble whenever they get possession. This isn’t a requirement, just an option. Only bounce passes allowed – Restrict your players too using bounce passes. 3 teams – The drills starts by dividing your team into 3 teams of between 3 - 5 players. Two teams start on defense in each half. Third team is in the middle of the court on offense. The offensive team chooses one side and attempts to score without dribbling. Same scoring system as above. After a score or change of possession, the defense team gets the basketball and attacks going the opposite way. The previous offensive team can play defense until half-court. Play until one team reaches 5 or 11 points. It’s important to instruct the players to keep great spacing and make smart cuts in order to receive the ball. If you need to — intervene to make corrections or re-emphasise the most important points of the drill (spacing, cutting), but keep it short. All passes should be at least 3 feet in length. Don’t allow players to run up and hand the basketball to each other. Footwork is important in this drill. Ensure players aren’t traveling and that they’re using their pivots correctly. Players should be calling for the basketball and using target hands when cutting to receive the basketball.